This article is about the historical models of the atom. For a history of the study of how atoms combine to form molecules, see History of molecular theory. The word atom comes from the Ancient Greek adjective atomos, meaning "indivisible". 19th century chemists began using the term in connection with the growing number of irreducible chemical elements. Around the turn of the 20th century, through various experiments with electromagnetism and radioactivity, physicists discovered that the so-called "uncuttable atom" was actually a conglomerate of various subatomic particles (chiefly, electrons, protons and neutrons) which can exist separately from each other. In fact, in certain extreme environments, such as neutron stars, extreme temperature and pressure prevents atoms from existing at all. Since atoms were found to be divisible, physicists later invented the term "elementary particles" to describe the "uncuttable", though not indestructible, parts of an atom. The field of science which studies subatomic particles is particle physics, and it is in this field that physicists hope to discover the true fundamental nature of matter. The idea that matter is made up of discrete units is a very old idea, appearing in many ancient cultures such as Greece and India. The word "atom" (Greek: ἄτομος; atomos), meaning "uncuttable", was coined by the Pre-Socratic Greek philosophers Leucippus and his pupil Democritus (c. 460 – c. 370 BC). Democritus taught that atoms were infinite in number, uncreated, and eternal, and that the qualities of an object result from the kind of atoms that compose it. Democritus's atomism was refined and elaborated by the later Greek philosopher Epicurus (341 – 270 BC), and by the Roman Epicurean poet Lucretius (c. 99 – c. 55 BC). During the Early Middle Ages, atomism was mostly forgotten in western Europe, but survived among some groups of Islamic philosophers. During the 12th century, atomism became known again in western Europe through references to it in the newly-rediscovered writings of Aristotle. In the 14th century, the rediscovery of major works describing atomist teachings, including Lucretius's De rerum natura and Diogenes Laërtius's Lives and Opinions of Eminent Philosophers, led to increased scholarly attention on the subject. Nonetheless, because atomism was associated with the philosophy of Epicureanism, which contradicted orthodox Christian teachings, belief in atoms was not considered acceptable by most European philosophers. The French Catholic priest Pierre Gassendi (1592 – 1655) revived Epicurean atomism with modifications, arguing that atoms were created by God and, though extremely numerous, are not infinite. Gassendi's modified theory of atoms was popularized in France by the physician François Bernier (1620 – 1688) and in England by the natural philosopher Walter Charleton (1619 – 1707). The chemist Robert Boyle (1627 – 1691) and the physicist Isaac Newton (1642 – 1727) both defended atomism and, by the end of the 17th century, it had become accepted by portions of the scientific community. Near the end of the 18th century, two laws about chemical reactions emerged without referring to the notion of an atomic theory. The first was the law of conservation of mass, closely associated with the work of Antoine Lavoisier, which states that the total mass in a chemical reaction remains constant (that is, the reactants have the same mass as the products). The second was the law of definite proportions. First established by the French chemist Joseph Louis Proust in 1799, this law states that if a compound is broken down into its constituent chemical elements, then the masses of the constituents will always have the same proportions by weight, regardless of the quantity or source of the original substance. John Dalton studied and expanded upon this previous work and defended a new idea, later known as the law of multiple proportions: if the same two elements can be combined to form a number of different compounds, then the ratios of the masses of the two elements in their various compounds will be represented by small whole numbers. For example, Proust had studied tin oxides and found that there is one type of tin oxide that is 88.1% tin and 11.9% oxygen and another type that is 78.7% tin and 21.3% oxygen (these are tin(II) oxide and tin dioxide respectively). Dalton noted from these percentages that 100g of tin will combine either with 13.5g or 27g of oxygen; 13.5 and 27 form a ratio of 1:2. Dalton found several examples of such instances of integral multiple combining proportions, and asserted that the pattern was a general one. Most importantly, he noted that an atomic theory of matter could elegantly explain this law, as well as Proust's law of definite proportions. For example, in the case of Proust's tin oxides, one tin atom will combine with either one or two oxygen atoms to form either the first or the second oxide of tin. Dalton believed atomic theory could explain why water absorbed different gases in different proportions - for example, he found that water absorbed carbon dioxide far better than it absorbed nitrogen. Dalton hypothesized this was due to the differences in mass and complexity of the gases' respective particles. Indeed, carbon dioxide molecules (CO2) are heavier and larger than nitrogen molecules (N2). Dalton proposed that each chemical element is composed of atoms of a single, unique type, and though they cannot be altered or destroyed by chemical means, they can combine to form more complex structures (chemical compounds). This marked the first truly scientific theory of the atom, since Dalton reached his conclusions by experimentation and examination of the results in an empirical fashion. Dalton estimated the atomic weights according to the mass ratios in which they combined, with the hydrogen atom taken as unity. However, Dalton did not conceive that with some elements atoms exist in molecules—e.g. pure oxygen exists as O2. He also mistakenly believed that the simplest compound between any two elements is always one atom of each (so he thought water was HO, not H2O). This, in addition to the crudity of his equipment, flawed his results. For instance, in 1803 he believed that oxygen atoms were 5.5 times heavier than hydrogen atoms, because in water he measured 5.5 grams of oxygen for every 1 gram of hydrogen and believed the formula for water was HO. Adopting better data, in 1806 he concluded that the atomic weight of oxygen must actually be 7 rather than 5.5, and he retained this weight for the rest of his life. Others at this time had already concluded that the oxygen atom must weigh 8 relative to hydrogen equals 1, if one assumes Dalton's formula for the water molecule (HO), or 16 if one assumes the modern water formula (H2O). The flaw in Dalton's theory was corrected in principle in 1811 by Amedeo Avogadro. Avogadro had proposed that equal volumes of any two gases, at equal temperature and pressure, contain equal numbers of molecules (in other words, the mass of a gas's particles does not affect the volume that it occupies). Avogadro's law allowed him to deduce the diatomic nature of numerous gases by studying the volumes at which they reacted. For instance: since two liters of hydrogen will react with just one liter of oxygen to produce two liters of water vapor (at constant pressure and temperature), it meant a single oxygen molecule splits in two in order to form two particles of water. Thus, Avogadro was able to offer more accurate estimates of the atomic mass of oxygen and various other elements, and made a clear distinction between molecules and atoms. In 1827, the British botanist Robert Brown observed that dust particles inside pollen grains floating in water constantly jiggled about for no apparent reason. In 1905, Albert Einstein theorized that this Brownian motion was caused by the water molecules continuously knocking the grains about, and developed a hypothetical mathematical model to describe it. This model was validated experimentally in 1908 by French physicist Jean Perrin, thus providing additional validation for particle theory (and by extension atomic theory). The cathode rays (blue) were emitted from the cathode, sharpened to a beam by the slits, then deflected as they passed between the two electrified plates. Atoms were thought to be the smallest possible division of matter until 1897 when J.J. Thomson discovered the electron through his work on cathode rays. A Crookes tube is a sealed glass container in which two electrodes are separated by a vacuum. When a voltage is applied across the electrodes, cathode rays are generated, creating a glowing patch where they strike the glass at the opposite end of the tube. Through experimentation, Thomson discovered that the rays could be deflected by an electric field (in addition to magnetic fields, which was already known). He concluded that these rays, rather than being a form of light, were composed of very light negatively charged particles he called "corpuscles" (they would later be renamed electrons by other scientists). He measured the mass-to-charge ratio and discovered it was 1800 times smaller than that of hydrogen, the smallest atom. These corpuscles were a particle unlike any other previously known. Thomson suggested that atoms were divisible, and that the corpuscles were their building blocks. To explain the overall neutral charge of the atom, he proposed that the corpuscles were distributed in a uniform sea of positive charge; this was the plum pudding model as the electrons were embedded in the positive charge like plums in a plum pudding (although in Thomson's model they were not stationary). Left: Expected results: alpha particles passing through the plum pudding model of the atom with negligible deflection. Right: Observed results: a small portion of the particles were deflected by the concentrated positive charge of the nucleus. In the Geiger–Marsden experiment, Hans Geiger and Ernest Marsden (colleagues of Rutherford working at his behest) shot alpha particles at thin sheets of metal and measured their deflection through the use of a fluorescent screen. Given the very small mass of the electrons, the high momentum of the alpha particles, and the low concentration of the positive charge of the plum pudding model, the experimenters expected all the alpha particles to pass through the metal foil without significant deflection. To their astonishment, a small fraction of the alpha particles experienced heavy deflection. Rutherford concluded that the positive charge of the atom must be concentrated in a very tiny volume to produce an electric field sufficiently intense to deflect the alpha particles so strongly. The planetary model of the atom had two significant shortcomings. The first is that, unlike planets orbiting a sun, electrons are charged particles. An accelerating electric charge is known to emit electromagnetic waves according to the Larmor formula in classical electromagnetism. An orbiting charge should steadily lose energy and spiral toward the nucleus, colliding with it in a small fraction of a second. The second problem was that the planetary model could not explain the highly peaked emission and absorption spectra of atoms that were observed. In 1917 Rutherford bombarded nitrogen gas with alpha particles and observed hydrogen nuclei being emitted from the gas (Rutherford recognized these, because he had previously obtained them bombarding hydrogen with alpha particles, and observing hydrogen nuclei in the products). Rutherford concluded that the hydrogen nuclei emerged from the nuclei of the nitrogen atoms themselves (in effect, he had split a nitrogen). From his own work and the work of his students Bohr and Henry Moseley, Rutherford knew that the positive charge of any atom could always be equated to that of an integer number of hydrogen nuclei. This, coupled with the atomic mass of many elements being roughly equivalent to an integer number of hydrogen atoms - then assumed to be the lightest particles - led him to conclude that hydrogen nuclei were singular particles and a basic constituent of all atomic nuclei. He named such particles protons. Further experimentation by Rutherford found that the nuclear mass of most atoms exceeded that of the protons it possessed; he speculated that this surplus mass was composed of previously-unknown neutrally charged particles, which were tentatively dubbed "neutrons". In 1928, Walter Bothe observed that beryllium emitted a highly penetrating, electrically neutral radiation when bombarded with alpha particles. It was later discovered that this radiation could knock hydrogen atoms out of paraffin wax. Initially it was thought to be high-energy gamma radiation, since gamma radiation had a similar effect on electrons in metals, but James Chadwick found that the ionization effect was too strong for it to be due to electromagnetic radiation, so long as energy and momentum were conserved in the interaction. In 1932, Chadwick exposed various elements, such as hydrogen and nitrogen, to the mysterious "beryllium radiation", and by measuring the energies of the recoiling charged particles, he deduced that the radiation was actually composed of electrically neutral particles which could not be massless like the gamma ray, but instead were required to have a mass similar to that of a proton. Chadwick now claimed these particles as Rutherford's neutrons. For his discovery of the neutron, Chadwick received the Nobel Prize in 1935. 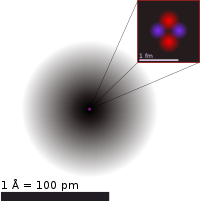 The five filled atomic orbitals of a neon atom separated and arranged in order of increasing energy from left to right, with the last three orbitals being equal in energy. Each orbital holds up to two electrons, which most probably exist in the zones represented by the colored bubbles. Each electron is equally present in both orbital zones, shown here by color only to highlight the different wave phase. In 1924, Louis de Broglie proposed that all moving particles—particularly subatomic particles such as electrons—exhibit a degree of wave-like behavior. Erwin Schrödinger, fascinated by this idea, explored whether or not the movement of an electron in an atom could be better explained as a wave rather than as a particle. Schrödinger's equation, published in 1926, describes an electron as a wavefunction instead of as a point particle. This approach elegantly predicted many of the spectral phenomena that Bohr's model failed to explain. Although this concept was mathematically convenient, it was difficult to visualize, and faced opposition. One of its critics, Max Born, proposed instead that Schrödinger's wavefunction described not the electron but rather all its possible states, and thus could be used to calculate the probability of finding an electron at any given location around the nucleus. This reconciled the two opposing theories of particle versus wave electrons and the idea of wave–particle duality was introduced. This theory stated that the electron may exhibit the properties of both a wave and a particle. For example, it can be refracted like a wave, and has mass like a particle. A consequence of describing electrons as waveforms is that it is mathematically impossible to simultaneously derive the position and momentum of an electron. This became known as the Heisenberg uncertainty principle after the theoretical physicist Werner Heisenberg, who first described it and published it in 1927. This invalidated Bohr's model, with its neat, clearly defined circular orbits. The modern model of the atom describes the positions of electrons in an atom in terms of probabilities. An electron can potentially be found at any distance from the nucleus, but, depending on its energy level, exists more frequently in certain regions around the nucleus than others; this pattern is referred to as its atomic orbital. The orbitals come in a variety of shapes-sphere, dumbbell, torus, etc.-with the nucleus in the middle. ^ Pullman, Bernard (1998). The Atom in the History of Human Thought. Oxford, England: Oxford University Press. pp. 31–33. ISBN 978-0-19-515040-7. ^ a b Kenny, Anthony (2004). Ancient Philosophy. A New History of Western Philosophy. 1. Oxford, England: Oxford University Press. pp. 26–28. ISBN 0-19-875273-3. ^ a b c d e f g h i j Pyle, Andrew (2010). "Atoms and Atomism". In Grafton, Anthony; Most, Glenn W.; Settis, Salvatore (eds.). The Classical Tradition. Cambridge, Massachusetts and London, England: The Belknap Press of Harvard University Press. pp. 103–104. ISBN 978-0-674-03572-0. ^ a b c d Cohen, Henri; Lefebvre, Claire, eds. (2017). Handbook of Categorization in Cognitive Science (Second ed.). Amsterdam, The Netherlands: Elsevier. p. 427. ISBN 978-0-08-101107-2. ^ Weisstein, Eric W. "Lavoisier, Antoine (1743-1794)". scienceworld.wolfram.com. Retrieved 2009-08-01. ^ Proust, Joseph Louis. "Researches on Copper", excerpted from Ann. chim. 32, 26-54 (1799) [as translated and reproduced in Henry M. Leicester and Herbert S. Klickstein, A Source Book in Chemistry, 1400–1900 (Cambridge, Massachusetts: Harvard, 1952)]. Retrieved on August 29, 2007. ^ Andrew G. van Melsen (1952). From Atomos to Atom. Dover Publications. p. 137. ISBN 978-0-486-49584-2. ^ a b Dalton, John. "On the Absorption of Gases by Water and Other Liquids", in Memoirs of the Literary and Philosophical Society of Manchester. 1803. Retrieved on August 29, 2007. ^ Johnson, Chris. "Avogadro - his contribution to chemistry". Archived from the original on 2002-07-10. Retrieved 2009-08-01. ^ Alan J. Rocke (1984). Chemical Atomism in the Nineteenth Century. Columbus: Ohio State University Press. ^ Avogadro, Amedeo (1811). "Essay on a Manner of Determining the Relative Masses of the Elementary Molecules of Bodies, and the Proportions in Which They Enter into These Compounds". Journal de Physique. 73: 58–76. ^ Einstein, A. (1905). "Über die von der molekularkinetischen Theorie der Wärme geforderte Bewegung von in ruhenden Flüssigkeiten suspendierten Teilchen". Annalen der Physik. 322 (8): 549–560. Bibcode:1905AnP...322..549E. doi:10.1002/andp.19053220806. hdl:10915/2785. ^ Thomson, J.J. (1897). "Cathode rays" ([facsimile from Stephen Wright, Classical Scientific Papers, Physics (Mills and Boon, 1964)]). Philosophical Magazine. 44 (269): 293. doi:10.1080/14786449708621070. ^ Thomson, J.J. (1904). "On the Structure of the Atom: an Investigation of the Stability and Periods of Oscillation of a number of Corpuscles arranged at equal intervals around the Circumference of a Circle; with Application of the Results to the Theory of Atomic Structure". Philosophical Magazine. 7 (39): 237. doi:10.1080/14786440409463107. ^ Geiger, H (1910). "The Scattering of the α-Particles by Matter". Proceedings of the Royal Society. A 83: 492–504. ^ Rutherford, Ernest (1911). "The Scattering of α and β Particles by Matter and the Structure of the Atom" (PDF). Philosophical Magazine. 21 (4): 669. Bibcode:2012PMag...92..379R. doi:10.1080/14786435.2011.617037. ^ a b c Bohr, Niels (1913). "On the constitution of atoms and molecules" (PDF). Philosophical Magazine. 26 (153): 476–502. doi:10.1080/14786441308634993. ^ "Frederick Soddy, The Nobel Prize in Chemistry 1921". Nobel Foundation. Retrieved 2008-01-18. ^ Thomson, J.J. (1913). "Rays of positive electricity". Proceedings of the Royal Society. A 89 (607): 1–20. Bibcode:1913RSPSA..89....1T. doi:10.1098/rspa.1913.0057. [as excerpted in Henry A. Boorse & Lloyd Motz, The World of the Atom, Vol. 1 (New York: Basic Books, 1966)]. Retrieved on August 29, 2007. ^ Rutherford, Ernest (1919). "Collisions of alpha Particles with Light Atoms. IV. An Anomalous Effect in Nitrogen". Philosophical Magazine. 37 (222): 581. doi:10.1080/14786440608635919. ^ Chadwick, James (1932). "Possible Existence of a Neutron" (PDF). Nature. 129 (3252): 312. Bibcode:1932Natur.129Q.312C. doi:10.1038/129312a0. ^ Schrödinger, Erwin (1926). "Quantisation as an Eigenvalue Problem". Annalen der Physik. 81 (18): 109–139. Bibcode:1926AnP...386..109S. doi:10.1002/andp.19263861802. ^ Mahanti, Subodh. "Erwin Schrödinger: The Founder of Quantum Wave Mechanics". Archived from the original on 2009-04-17. Retrieved 2009-08-01. ^ Mahanti, Subodh. "Max Born: Founder of Lattice Dynamics". Archived from the original on 2009-01-22. Retrieved 2009-08-01. ^ Greiner, Walter. "Quantum Mechanics: An Introduction". Retrieved 2010-06-14. ^ Heisenberg, W. (1927). "Über den anschaulichen Inhalt der quantentheoretischen Kinematik und Mechanik". Zeitschrift für Physik (in German). 43 (3–4): 172–198. Bibcode:1927ZPhy...43..172H. doi:10.1007/BF01397280. ^ Milton Orchin; Roger Macomber; Allan Pinhas; R. Wilson. "The Vocabulary and Concepts of Organic Chemistry, Second Edition," (PDF). Retrieved 2010-06-14. Eric Scerri (2007) The Periodic Table, Its Story and Its Significance, Oxford University Press, New York. Charles Adolphe Wurtz (1881) The Atomic Theory, D. Appleton and Company, New York. Alan J. Rocke (1984) Chemical Atomism in the Nineteenth Century: From Dalton to Cannizzaro, Ohio State University Press, Columbus (open access full text at http://digital.case.edu/islandora/object/ksl%3Ax633gj985). Atomic Theory - detailed information on atomic theory with respect to electrons and electricity.